Lit review finds ‘significant link’ between cannabis use and onset of mania symptoms. Researchers from the University of Warwick have found evidence to suggest a significant relationship between cannabis use and the onset and exacerbation of mania symptoms. The researchers carried out a review of scientific literature examining the effect of cannabis use. The literature sampled 2,391 individuals who had experienced mania symptoms. Mania symptoms are part of bipolar disorder and can include feelings of persistent elation, heightened energy and hyperactivity and a reduced need for sleep. Mania can also make people feel angry and aggressive with extreme symptoms including becoming delusional or hearing voices. The researchers looked at a number of previous studies and concluded that cannabis use preceded the onset of mania symptoms. The team explain that the observed tendency for cannabis use to precede or coincide with rather than follow mania symptoms, and the more specific association between cannabis use and new onset manic symptoms, suggests potential causal influences from cannabis use to the development of mania. It is a significant link. The review suggested that cannabis use significantly worsened mania symptoms in people who had previously been diagnosed with bipolar disorder. The team summise that there are limited studies addressing the association of cannabis use and manic symptoms, which suggests this is a relatively neglected clinical issue. However the review suggests that cannabis use is a major clinical problem occurring early in the evolving course of bipolar disorder. More research is needed to consider and image specific pathways from cannabis use to mania and how these may be effected by genetic vulnerability and environmental risk factors. Cannabis is the most prevalent drug used by the under-18s and during this critical period of development services should be especially aware of and responsive to the problems that cannabis use can cause for adolescent populations. Thalamic surface shape differences. (A) Control subjects with a history of cannabis use disorder (CON-CUD) contrasted with control subjects with no history of substance use disorders (CON-Clean), (B) schizophrenia subjects with no history of substance use disorders (SCZ-Clean) contrasted with CON-Clean, (C) schizophrenia subjects with a history of cannabis use disorder (SCZ-CUD) contrasted with SCZ-Clean. T-values with cooler colors (T 0) indicate outward shape differences. 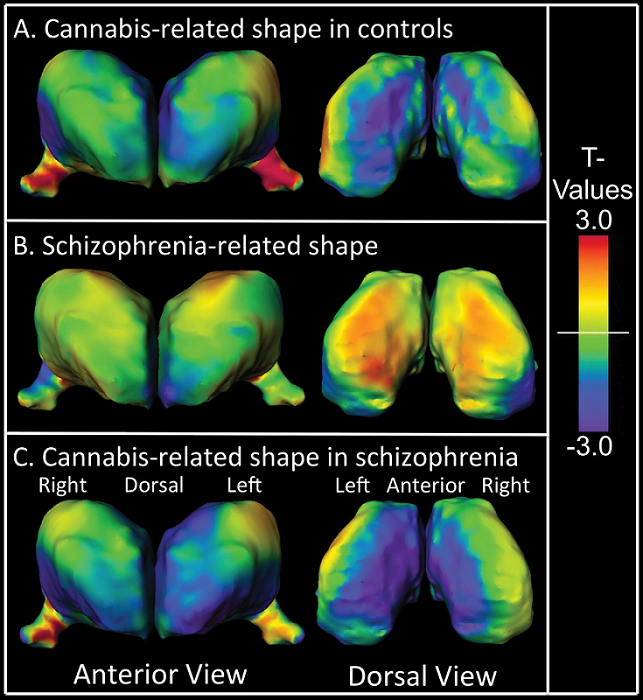 Cannabis-Related Working Memory Deficits and Associated Subcortical Morphological Differences in Healthy Individuals and Schizophrenia Subjects. Csernansky et al 2013. This is identical to a side effect of major concern in virtually ALL effective Antidepressant Pharmaceuticals, and Herbals (i.e, St. John’s Wort), if this “meta-analysis” (Monte Carlo simulations or “runs” of existing data –in this case correlational data with a wide range of varying reliability and validity) demonstrates ANYTHING –it is that CANNABINOIDS, and indeed cannabis itself, should be studied (screened) for antidepressant efficacy, starting with preclinical animal models such as forced swim, Chronic Unpredictable Stress, etc.